Midway Striping & Sealcoating was founded by Lawrence Otto in 1979 when he moved from Oklahoma, there he worked for an asphalt company as a parking lot striper. The company started as just Midway Striping. 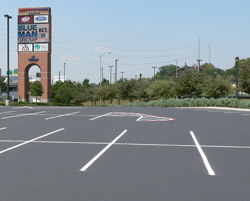 He partnered with asphalt companies and built his business from the ground up, “We earned the asphalt companies trust and soon they began asking us to provide sealcoating.” Which is how the name grew to Midway Sealcoating & Striping Company, incorporated in 2010. Lawrence still currently owns and operates Midway Striping & Sealcoating. He works hard to ensure that you, as a customer, are satisfied. Our Head Forman, Tim, has been with us for over 20 years and with the help of Otto has trained each of our crew members personally to insure proper service and technique. Our company takes pride in the quality of work we provide to our customers, “I had to establish the right reputation from the start.” Otto said. We have worked on some of the highest trafficked areas in DFW such as the American Airlines Center, Six Flags Over Texas, and the DFW Airport. We are fully insured and well established. With over 30 years experience and our vast knowledge of parking lot maintenance and curb appeal, we will help you decide the best solution to your needs. Looking for expert sealcoating and asphalt maintenance services? Look no further. Please call us at 817.467.7003 or fax your requests to 817.465.1665 to reach a member of our team.